2 hours of affordable group instruction to help improve your skills on the slopes! Lessons built just for new snowsports participants to get a solid foundation! Cooper's most popular children's program is an all-day learn-to-ski program! Explore 2,600 Acres of Powder! A new window will open with an availability calendar. Enjoy all that Cooper has to offer with no limitations and no restrictions for the entire ski season! Enjoy the family-friendly atmosphere, and the wallet-friendly pricing. Plus, take advantage of all of the additional benefits of our season pass, including discounts at Cooper establishments, and FREE SKIING (3 days) at EACH of our partner resorts. Season Pass partners are being confirmed at this time with additional partners expected. **Powder Mountain limits daily skier visits to 1500 people. Please plan to arrive early when skiing Powder Mountain or choose less busy times to go to this location. Bring your Ski Cooper Season Pass and additional photo ID to the ticket window of partner resorts to receive discounts. Partner resort benefits are only available to season pass holders, and are non-transferable. Benefits do not apply to any other pass or lift ticket products. Partner resort privileges are subject to change without notice. When skiing/riding at a partner resort, you are bound to the rules and policies of the partner resort. 4-Pack – Each season pass holder may purchase a 4-pack of lift tickets for only $160. Tickets have no blackout dates or exclusions and can be used at any time by anyone. Use all 4 in one day for 4 different friends, or give them all to one person so they can go 4 times! One 4-pack per pass holder per season can be purchased at the Ski Cooper Ticket Window during regular business hours. Buddy Ticket – Season pass holders can purchase a discounted buddy ticket for $42. Present your season pass at the Ski Cooper Ticket Window to purchase. Buddy Tickets must be used the same day as purchased and cannot be combined with any other offer. Available Monday-Friday. Season passes have no date restrictions. They must be presented to and scanned by the lift operator each time you ski. Each pass holder must sign (or have his/her parent/legal guardian sign) the Waiver of Liability and Assumption of Risk each season. New pictures must be taken in person at the Guest Services Desk in the lower level of the lodge. Skiers and Riders are responsible for knowing the Skier Responsibility Code and the Colorado Skier Safety Act. Season pass is non-transferable and may be used only by the person designated on the pass. Failure to comply with the above conditions or misuse could result in the revocation of season pass privileges. Report any lost season passes to the ticket office immediately. There is a $10 re-issue fee. Ski Cooper is operated and maintained under the authority of a USDA Forest Service Special Use Permit. Ski Cooper is an Equal Opportunity Service Provider. 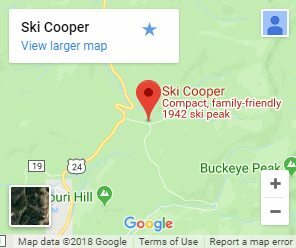 Copyright © 2018 Cooper Hill Ski Area, Inc.